When I found this 34mm. 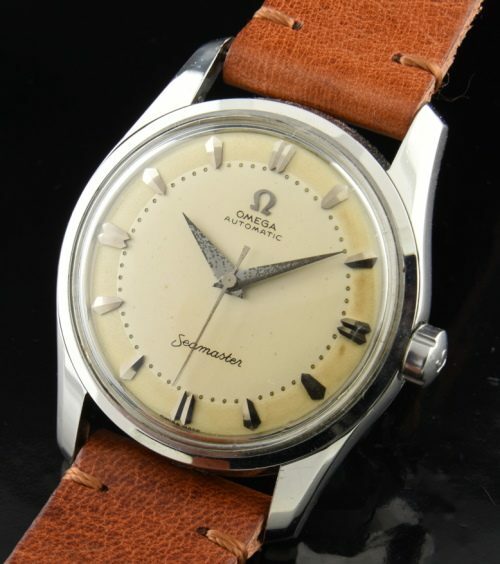 OMEGA SEAMASTER dating to 1956, I was intrigued by the original and amazing dial! Look at these steel Chevron style markers and original Dauphine hands, plus the fine and even patina. This is a two-tone dial and when it catches the light-amazing. The OMEGA Crown is correct. A correct OMEGA hesalite crystal is installed. The automatic winding caliber 501 movement was surprisingly shiny and clean looking for a watch of this age. We just had the movement fully cleaned and it is accurate.